Dubai, March 12, 2018: Al-Futtaim Honda, exclusive distributor of Honda cars, bikes, marine engines and power products in the UAE, has announced the launch of the all-new 2018 Honda Accord. The all-new Accord is the 10th generation of Honda’s perennially best-selling midsize sedan. All-new from the ground up, the 2018 Accord is built on a new platform with a lower, wider stance, a lighter and more rigid unibody structure; a lighter and more sophisticated chassis; two advanced new power units, including Accord’s first-ever turbocharged engines, and a new 10-speed automatic transmission. In recreating Accord for its 10th generation, Honda designers and engineers sought to convey ‘absolute confidence’ in every element of design and performance. Building on the bedrock character of Accord – its outstanding quality, fuel efficiency, packaging and sophisticated driving dynamics – they have imbued the 10th-generation Accord with a new level of emotional appeal and premium quality; an Accord that defies its mainstream midsize sedan status, providing even more refined and engaging performance, a more spacious and upscale interior, and the latest generation of advanced Honda safety and driver-assistive technologies. In reimagining Accord, designers first established the fundamental packaging strategy. Consistent with the “Man Maximum-Machine Minimum (MM)” design philosophy that underpins all Honda designs, the team shrunk the Accord’s footprint while expanding its interior space, at the same time creating more premium and athletic proportions and stance. The move to 4-cylinder engines across the line-up is a key component of this approach, allowing a shorter engine bay while also reducing weight and improving dynamic performance. The new Accord has a longer wheelbase (+55 mm), a lower overall height (-15 mm), a wider body (+10 mm) and a shortened overall length (-15 mm). A sweeping greenhouse, positioned farther back on the body, completes the new stance and proportion of the next-generation Accord. The combined effect of these changes is a more premium look, highlighted by shorter overhangs, a bold front fascia, a long and low hood, and a visual centre of gravity moved closer to the rear wheels. Viewed head-on, the new Accord's greenhouse also angles in more sharply from the window sills to the roof, further emphasizing the wide lower body, while inside the cabin the seats have been moved slightly inward, which contributes to improved hip, shoulder and headroom while enhancing occupants' freedom of movement. In addition, the longer wheelbase allowed designers to move the second-row seats substantially rearward, giving Accord 48 mm of added rear legroom. Overall passenger volume is increased by 70 litres (LX trim) and trunk space, at 473 litres on all models and trims, is up 25 litres on 1.5-liter and 2.0-liter models. Elegant and modern exterior detailing compliments the Accord's new, more dynamic design. The bold and upright front fascia is highlighted by Honda's signature chrome wing front grille positioned above a large main air intake and flanked by available 9-lamp full-LED headlights and LED fog lights. The chiselled hood features a distinctive and aggressive raised centre, and the deeply sculpted body sides enhance the visual length and strength of the lower body. The 10th generation 2018 Accord takes an entirely new approach to performance with its two-new direct-injected VTEC® Turbo 4-cylinder engines with dual VTC – a 1.5-liter 16-valve inline-4 and a 2.0-liter 16-valve DOHC inline-4. Both new turbocharged engines produce peak torque across a broad range of engine speed (RPM), delivering smooth and virtually lag-free power for exceptional throttle response and power delivery in all driving conditions. The 1.5-liter turbo is mated to a Honda continuously variable automatic transmission (CVT) with G-Shift Control. The new 2.0-liter turbo is mated to a smooth, responsive Honda-designed 10-speed automatic, the first of its kind for a front-wheel-drive car. The two new automatic transmissions take greater advantage of available torque while maximizing quietness and efficiency during highway cruising. The redesigned CVT has an 11 percent lower ratio compared to the previous generation version for more powerful launch performance, while the new 10AT is 9kg lighter, with a 43-percent lower first gear and a 17-percent taller top gear compared to the previous generation Accord’s 6-speed automatic. 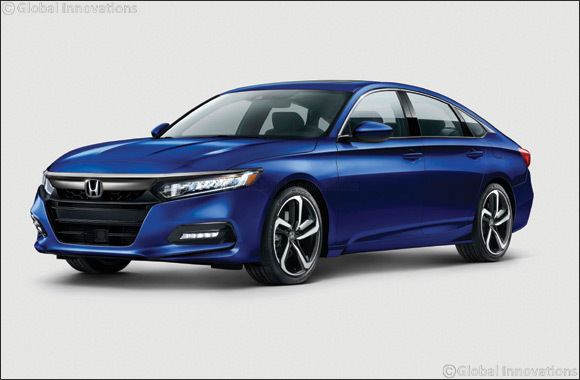 The new DOHC 1.5-liter engine in the Accord is a further evolution of the powerplant first introduced in the 2016 Civic With direct injection, a low-inertia Mono scroll turbo with electric waste-gate and dual Variable Timing Control (VTC), the turbocharged powerplant delivers more horsepower and torque than before. Power output is increased in part by a new “4-into-2” exhaust manifold that improves the flow of exhaust gas to the turbo. Peak output of 148kw (198hp) at 5,500 rpm and 260 Nm of torque from 1,600 to 5,000 rpm, compared to 141kw (189 hp) at 6,400 rpm and 247 Nm of torque at 3,900 rpm on the previous Accord’s normally aspirated 2.4-liter engine. The Accord’s 2.0-liter engine uses a turbocharger with a smaller, low-inertia turbine for improved low-rpm boost response. With a maximum of 20.8 psi boost, the Accord’s 2.0-liter powerplant peak output is 184kw (247hp) at 6,500 rpm and 370 Nm of torque from 1,500 to 3,500 rpm. With peak torque available at a much lower engine rpm, responsiveness and acceleration are notably enhanced. The 2.0-liter turbo also offers much broader power delivery, holding a torque advantage over the V6 that spans the entire operating range between 1200 and 4800 rpm – the engine rpm range that is typically used the most. Accord 1.5-liter offers the responsiveness and efficiency of an available Continuously Variable Transmission (CVT). The CVT has smooth and predictable gear ratio transitions and excellent acceleration matched with efficient low-rpm cruising. A wide ratio spread results in strong acceleration performance coupled with reduced engine rpm at high road speeds. Accord 2.0-liter models are available with a new, Honda-developed 10-speed automatic transmission (10AT), the first of its kind in the Accord’s segment. Engineered for high efficiency with low internal inertia and an exceptionally wide ratio range, the 10AT maximizes the Accord’s performance and fuel efficiency. Compared to the previous 6-speed automatic, the 10AT is 9kg. lighter and has a 68 percent wider overall ratio range with a 43 percent lower first gear and a 17 percent taller top gear. The 10AT is designed to be lightweight and compact. It features four planetary gear sets that work together to provide an exceptionally wide ratio spread of 10.139:1 compared to 6.041:1 on the previous-generation Accord’s 6-speed unit. The 10-speed also has substantially faster upshift and downshift performance than the previous generation 6-speed transmission. For greater responsiveness, the 10-speed transmission can make 4-gear direct downshifts: from 10th to 6th, or from 7th to 3rd. To maximize fuel efficiency and minimize interior noise, the transmission’s 10th gear is exceptionally tall, resulting in quiet and relaxed cruising rpm. In the 2018 Accord with 10-speed automatic transmission, the conventional shift lever is replaced with a fully electronic, shift-by-wire gear selector. Park, Neutral and Drive are selected with the push of a button. Reverse is selected by pulling back a dedicated switch. Indicator lights on or next to the buttons indicate the mode selected. As an added safety feature, if the vehicle is brought to a stop in Drive or Reverse, the system will automatically select Park if the driver’s seatbelt is unbuckled and the driver’s door is opened. A steering wheel-mounted paddle shifter system lets the driver take manual control of transmission gear selection. In its evolution to becoming a more premium, sophisticated and aspirational sedan, the all-new 10th-generation Accord adopts a stronger, lighter and significantly more rigid body. Its lower and wider exterior proportions express a more premium and athletic stance, accentuated by a longer wheelbase and wider track, advanced LED exterior lighting (including available LED headlights and fog lights) and luxurious bright trim. A choice of new 17- and 18-inch alloy wheels (Three-wheel designs in total), all contribute to a more confident, youthful and sporty sedan. The next-generation Accord body uses over twice as much super high-strength steel (29 percent) as the previous-generation Accord Sedan – along with the model’s first use of structural adhesives – to increase global bending rigidity by 24 percent, torsional rigidity by 32 percent and floor bending rigidity by 12 percent, which in turn improves all aspects of the vehicle's dynamic performance. Widespread noise, vibration and harshness (NVH) countermeasures, including the flagship sedan’s first use of acoustic spray foam insulation, make the 2018 Accord the quietest, most comfortable and efficient Accord yet. Using a slightly shorter overhang than before, the front-end design is characteristically Honda, with the chrome wing grille and streamlined wing-shaped headlights (LED high/low beams on the 2.0 Sport trim), and aggressive air inlets presenting a strong image. Aggressive hood lines add an athletic look to the Accord front end, while thinner A-pillars moved rearward on the body (and relative to the driver’s seating position) improve outward visibility for the driver by 7.9 degrees compared to the previous Accord Sedan. The sporty body sides are distinguished by strong wheel arches, an emphatic character line running from front to rear along the beltline, concave door panels that capture the light just right, and strong, flowing lower sills that lend a look of solidity at the base of the body. With the new Accord’s longer wheelbase, the more spacious cabin is even more streamlined than before, with a more tapered rear section including longer and sleeker quarter windows. These windows contribute to a large “6-light glass” cabin that adds lightness, visibility and a sporty flair to the new Accord, while a bright trim strip flowing front to rear above the windows adds a windswept look. In back, the brightly trimmed rear fascia is as athletic and energetically designed as the front end, with a slightly longer overhang than found on the previous generation Accord. Here, a sharply tailored decklid helps air separate cleanly from the body, while bright trim (including dual bright exhaust finishers on both Sport & 2.0 Sport trim) add an upscale look, and dramatic light-pipe LED taillights define the Accord as all-new – and all Honda. The 2018 Accord has a high level of body sealing to dramatically reduce the levels of noise inside the vehicle. This includes weld seals and other sealers to reduce vibration and the transmission of noise. Altogether, these techniques result in a 43 percent reduction in body leaks, which significantly reduces noise entering the cabin in critical areas. In addition, Acoustic windshield glass, an additional carpet barrier layer, acoustic fabric body undercovers, front and rear acoustic felt fender inner liners, and Active Noise Control (ANC) technology further reduce engine and road noise. Acoustic laminated windshield glass helps reduce noise entering the cabin. Tuned specifically to reduce wind-, urban- and traffic-noise frequencies, the acoustic windshield uses an outer layer of safety glass, a thick middle layer of acoustic polyvinyl butyral PVB and an inner layer of glass for a total thickness of 4.7 mm. This helps the Accord place at the top of its class in wind-noise performance. The all-new 2018 Accord boasts a larger, more premium and tech-savvy interior that compliments its elegant new body design and more refined and athletic driving character. The new Accord’s wider body and longer wheelbase contribute to its improved cabin space, most notably an additional 48 mm of rear legroom, as well as an added 70 litres of interior volume, 25 litres of trunk space, despite its shorter, more compact and sporting exterior form, the result of Honda’s packaging expertise and “Man-Maximum, Machine Minimum” design philosophy. The new cabin is highlighted by a new ultra-low-profile, three-tiered instrument panel, an intricately contoured sport steering wheel, a new colour TFT digital driver’s meter and a “floating” 8-inch Display Audio touchscreen (EX Turbo and above). Meticulous attention to the tactile and visual quality of materials elevates the overall premium feeling of the cabin. The driver and front passenger are also treated to a panoramic view of the road ahead, made possible by the wider body, a lower cowl and newly designed A-pillars that are 20-percent narrower and moved rearward relative to the driver’s seating position. Ventilated and heated front seats, with memory position (top trims), add additional comfort and convenience. The tech-savvy cabin’s new 7-inch Thin Film Transistor (TFT) digital drivers meter offers a wide-array of driver-selectable information displays, while an available new 8-inch Display Audio touchscreen features both physical volume and tuning/list-scrolling knobs along with a more intuitive app-based user interface, Apple CarPlay™ and Android Auto™ compatibility, is available from EX Turbo onwards. 2.0T Sport model also features a new 6-inch driver’s head-up display, automatic Bluetooth® phone pairing. The Accord 2.0T Sport features a head-up display, which utilizes a concave mirror located behind the instrument panel to project a broad range of information on the lower portion of the windshield directly in front of the driver. The driver can adjust the location of the projection (up and down) or turn off the system via switches on the instrument panel. Display modes can be selected by a steering wheel-mounted thumb dial. The Accord instrument panel provides important vehicle information and connectivity content via a Driver Information Interface (DII) area of the instrument display positioned centrally in the instrument display. Controls positioned on the steering wheel allow the driver to cycle the Driver Information Interface (DII) through multiple screens of information from sources including trip computer, phone, audio, maintenance and more. Included on EX Turbo and above trims, the new Walk Away Door Lock feature automatically locks the Accord when the driver leaves the vehicle with the key fob. This hands-free locking capability adds everyday convenience that is especially useful when the driver has his or her hands full or is distracted. In typical use, when all doors are closed and the driver walks away, the Accord will automatically lock when the key holder’s distance from the vehicle exceeds 2m for two seconds or more, and when no other key is detected inside the vehicle. An audible buzzer sounds and the hazard lights flash to confirm that the vehicle has locked. The Walk Away Door Lock feature is programmable and may be turned on or off as the driver prefers. The tech-savvy and easy-to-use 2018 Accord cabin features an all-new Human-Machine Interface (HMI) that includes a new 8-inch Display Audio touchscreen (EX Turbo and above) with physical volume and tuning knobs and more intuitive, smartphone-like features and functionality including customizable app tiles and home-screen shortcuts, along with Apple CarPlay and Android Auto compatibility. Audio systems vary by trim, starting with 160 watts and 4 speakers on LX and Sport, 8 speakers and 180 watts on EX, and 10 speakers and 450 watts on 2.0T Sport trims. All trims feature USB charging ports (two 2.5-amp ports) along with Bluetooth connectivity. The 2018 Accord receives numerous safety improvements and driver assistive features, beginning with its next-generation Advanced Compatibility Engineering™ (ACE™) body structure, and the application of Honda Sensing®, as standard equipment on EX Turbo and 2.0T Sport trims. Accord also adds driver and front passenger knee airbags for the first time (Standard), plus rain-sensing windshield wipers (Sport 2.0T), an electric parking brake (EPB) (Standard) and available LED headlights (Hi/low Sport 2.0T). Electronic advancements include the first application of Driver Attention Monitor in the Accord (1.5 Sport and above trims). Structures in the front of the 2018 Accord are designed to help absorb energy in the event of a collision with a pedestrian. Research by Honda shows that the following features can dramatically improve a pedestrian's chance of survival if struck by a moving vehicle. Both front seats are designed to help mitigate the severity of neck injuries in the event of a rear impact by efficiently dispersing forces against the occupant as the seatback cushion compresses relative to the occupant's head. The seatback springs are optimized so that in a rear crash when the seatback is pushed forward into the occupant, the seat will absorb the occupant's mass in a manner that can help minimize the severity of a whiplash injury. New for the 2018 Accord, on highway and arterial roads the Driver Attention Monitor continually monitors and assesses driver behaviour behind the wheel to help determine if the driver is becoming inattentive – and then if so, warn the driver to take a break. The system uses input from the Electric Power Steering (EPS) to measure both the frequency and severity of the driver's steering inputs to gauge their level of awareness with four gradients. When the Driver Attention Monitor is activated, the driver is first alerted by a coffee cup icon and a 4-level bar graph that is displayed on the Driver Information Interface (DII) below the speedometer and tachometer. The bar graph indicates full attention when four white bar elements are illuminated. As the driver attention drops, fewer and fewer bars are illuminated. When the number of bars drops to two, a message inviting the driver to take a break is illuminated. If the driver continues driving and the graph drops to the lowest level of one bar, a beeper sounds and the steering wheel vibrates, prompting the driver to pay closer attention or take a rest break. Honda Sensing® helps provide greater awareness of driving conditions around the vehicle, providing warnings to the driver and, under certain conditions, aiding the driver in avoiding or mitigating the severity of a collision. Honda Sensing is standard on EX Turbo and 2.0T Sport trims. Adaptive Cruise Control (ACC) with Low-Speed Follow allows the driver to set a desired speed and following interval from a vehicle detected ahead, allowing the use of cruise control in light traffic conditions. This significantly reduces the driver stress of driving in traffic. The system uses the millimetre wave radar and monocular camera to continually track the distance to the vehicle detected ahead, and then adjusts the Accord’s speed to maintain the set following interval. A short, medium, long, or extra-long interval can be selected. When required, the Accord automatically brakes using the Vehicle Stability Assist (VSA) modulator. Integrated Low-Speed Follow extends the automatic following capability to stop-and-go traffic situations down to 0 mph. A visual warning is instead included in the head-up display on the Sport 2.0T trim. The 2018 Accord is available in 10 exterior colours including six pearlescent colours, four metallic and one solid colour. New to Honda and the Accord are Platinum White Pearl and Radiant Red Metallic. The Platinum White Pearl colour uses large-particle glass flakes for enhanced brilliance compared to traditional white pearl finishes, while in the Radiant Red Metallic colour; glittering metallic particles radiate light in a distinctive fashion. The all-new Honda Accord is available at Al-Futtaim Honda showrooms across the UAE and retails starting at AED 94,900 for the 1.5L LX Turbo, 1.5L LX Turbo Sport at AED 104,900, 1.5L EX Turbo at 119,900 and the 2L Turbo Sport at AED 139,900.